Two-time Grammy Award winner Mariachi Los Camperos was created in 1961 by Natividad “Nati” Cano. Mr. Cano played a fundamental role in the development of mariachi music in the United States by training and mentoring new generations of musicians. This giant of the genre was a visionary leader who wanted to take the mariachi performance out of customary locations such as Cantinas and into concert halls where celebrities performed. Nati Cano passed away in 2014 and left Mariachi Los Camperos, passing the leadership baton to Jesus “Chuy” Guzman, who has served as the musical director since 1992 after serving as Cano’s right-hand man for nearly three decades. 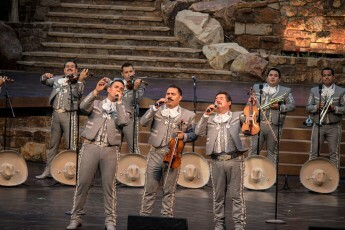 Under Guzman’s direction, Los Camperos released a 2015 Grammy-nominated musical tribute to Nati Cano called: Tradición, Arte, y Pasión, giving Mariachi Los Camperos their 4th Grammy nominations. In January of 2018, Mariachi Los Camperos became the featured Mariachi act in the First Mariachi Opera “Cruzar la Cara de la Luna”, making their first presentation in New York City. The award-winning Chicago Mariachi Project (CMP) is a nonprofit organization whose mission is to elevate the Art of Mariachi and promote excellence in musicianship through education, coordination and support. Through the longstanding efforts of CMP’s founders, they’ve been credited with having formally kicked off the mariachi education movement in Chicago. CMP currently runs after-school and in-school programs in Chicago Public Schools and a prestigious Mariachi Academy with students from the Greater Chicagoland area. 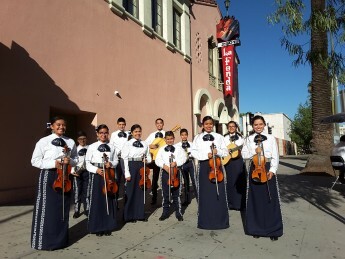 Students from CMP’s Mariachi Academy were awarded First Place in the High School Category and Third Place Overall at the renowned 27th Annual Mariachi Spectacular de Albuquerque, a national competition. In 2016, CMP embarked on the first tour by a student group from Chicago which took them to perform at the legendary La Fonda de Los Camperos. 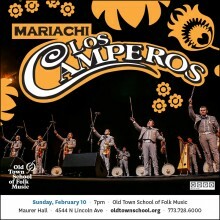 CMP welcomes Mariachi Los Camperos back to Chicago and is proud to be sharing the stage with them once again.